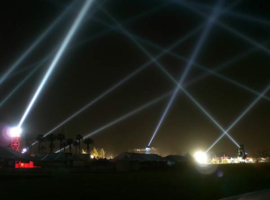 Using Xenon lighting systems, A&O Technology America succeeded in creating a breathtaking atmosphere at two major open-air music festivals on the Empire Polo Field in Indio, California. 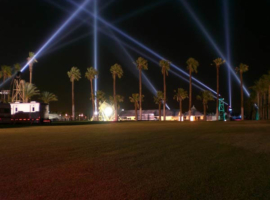 Each day from the 25th to the 27th April, some 70,000 people flocked to the Coachella Festival headlined by Prince, Jack Johnson, Roger Waters and Portishead. 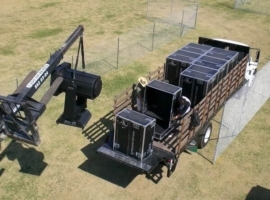 The following weekend, the same equipment was deployed at the popular Stagecoach country festival, which featured among others country greats like the Eagles, Rascal Flatts and Tim McGraw. 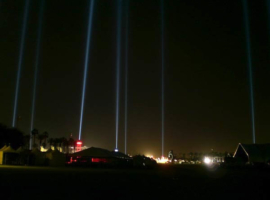 The A&O Team provided fitting illumination for both the three-day mega events with a lavish installation comprising twenty FALCON® BEAM 7,000W luminaires manufactured by alpha one. 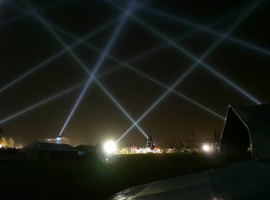 The A&O Technology team positioned the powerful searchlights on nine-metre towers ringing the 800 x 600-metre festival grounds. 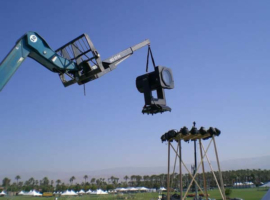 A telescope loader was used to hoist the alpha one lighting equipment into position on the tower platforms, whilst a basket lift deployed in parallel facilitated the work of rigging and wiring. 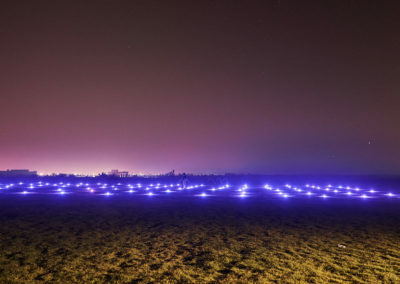 Since the towers were spaced at 120-metre intervals all round the field, wireless DMX was needed to control the FALCON® BEAM xenon searchlights. For this purpose, ten of the towers were equipped with the requisite radio link reception antennae and receivers. 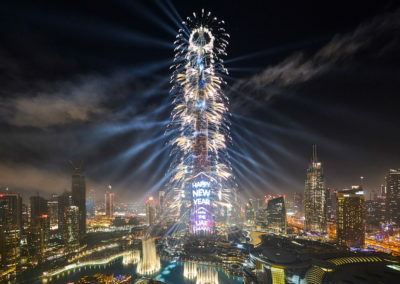 The data signal was conducted to the other towers by 500-foot DMX cables. These had to be specially ordered on account of their inordinate length. 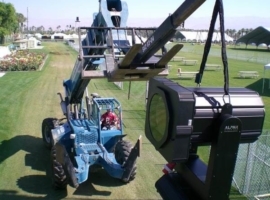 The team from A&O spent four days on site in advance of the Coachella Festival building up the installation, conducting lighting checks and programming the equipment. The day before the Stagecoach festival, the lighting specialists returned for a further system check and a fresh bout of programming. 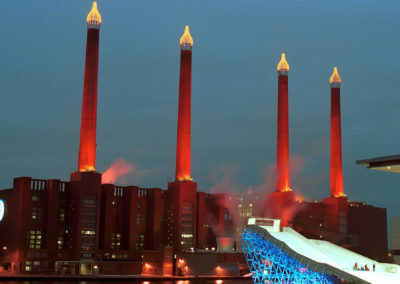 The commission for both events was awarded by Visions Lighting in the person of Todd Roberts, who joined with the festival management in lavishing fulsome praise on A&O Technology’s US subsidiary for its performance. One weekend after the Coachella Festival, the biggest Open Air Country Festival, “Stagecoach”, took place at the same area. More than 40 acts of different country music styles performed at four different stages. The 20 FALCON xenon lighting fixtures were installed at 9 metres high towers, and were positioned on the tower platforms with telehoist load lugger and lift cage. 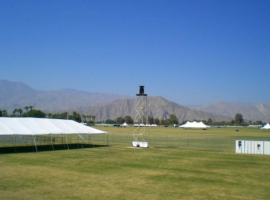 These searchlight towers stood around the 800 x 600 metres sized festival area, like at the Coachella Festival. The control of the xenon lighting systems via wireless DMX resulted from a central antenna which was fixed at the FOH of the sidestage.